It’s difficult to pinpoint exactly why Cuban black beans taste so good. They’re incredibly easy to make, cheap and you can easily make a big pot of them and feed a crowd. Just eating them makes you feel like your doing yourself a healthy favour, but not in some dour low-fat, heavy wholemeal kind of way. Black beans are known as one of the ‘super foods’ for the exceptional nutritional benefits they contain. Packed with fibre, protein calcium and iron, the distinctive, shiny black coating of the black bean also contains at least eight different flavonoids, which are antioxidants called anthocyanins (they’re the ones which are meant to help fight aging and cancer). Black beans also contain as much as three times the amount of Omega 3 fats as other legumes. They really are super good for you so it’s probably not just in my imagination that I can feel my hair follicles zinging after a meal of black beans and rice. I had a bad experience cooking dried black beans many years ago – I don’t know what I did – perhaps I added salt or something acidic before they were tender but they were tough and indigestible and I didn’t cook them again for many years. Then about a year ago, I bought a couple of cans of Goya black beans, made a bastardised version of Cuban black beans and was completely hooked. But at $4 a can, it felt like a bit of an indulgence for what is basically peasant food. So I tracked down some Galaxy dried black beans at my local IGA supermarket, looked up a recipe online and have never looked back. If the canned beans weren’t so expensive, I would definitely have them in my pantry as staple for a quick meal but, in reality, they don’t compare to a pot of freshly-cooked black beans in a garlicky oniony, sweet and sour gravy. The secret to a delicious pot of black beans is to simmer them slowly for at least an hour until tender. Then you add the fried onion, garlic, salt, herbs and spices and simmer again until you have deliciously thick aromatic gravy. The black beans will keep well in the refrigerator for three to four days but they also freeze well. So there’s no excuse for you not to make a big healthy pot of them. 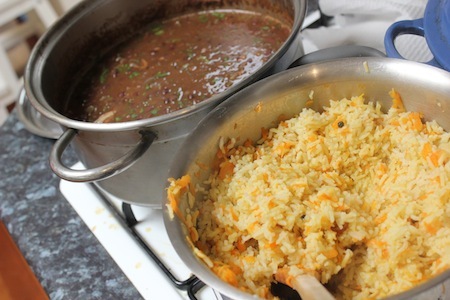 Black Beans are good as a week-night meal with plain rice but these beans are too good to keep for the everyday – dress them up with a Turkish carrot pilaf, some salads and sides and you really have a vegetarian feast. The recipe I use for Cuban black beans comes from Three Guys from Miami. It was one of the simpler ones I found online and felt fairly authentic to me. I didn’t have any dry red wine so I added a bit more vinegar and then a bit more sugar to temper it. I like to play around a bit with the vinegar and sugar (I usually use palm sugar) because I like a slightly more piquant, sweet and sour taste in my black beans. The recipe for Turkish carrot pilaf comes from Tess Mallos. It’s one of my favorites pilafs, its quite simple but it goes well with a broad range of Middle Eastern, Indian and Mediterranean style food. Because of the butter, it gets a gorgeous golden rice crust on the bottom of the pan while it cooks. Black beans are a great meal if your wondering what to serve up your vegan or gluten-free friends. Just note that to make the black beans gluten-free, you have to take care that your vinegar is gluten-free and that the rice pilaf, while gluten-free, is not vegan. Cover dry beans with water and soak overnight, drain and rinse. Place the cleaned black beans in a large four-litre (six quarts) saucepan. Add water and some olive oil (this will prevent the beans from foaming). Bring the beans to a boil, reduce heat to low, cover, and cook until the beans are tender, about one hour. (DO NOT add salt or anything acidic like tomatoes or vinegar to your beans at this stage or you will have very tough beans!) When the beans are tender DO NOT drain the beans, the bean broth is essential to make the rich aromatic gravy. Chop onion and green pepper. Mash the garlic with salt and peppercorns in a mortar and pestle. Sauté the onions and green pepper in olive oil until the onions are translucent. Add mashed garlic and sauté another minute or so. Add the cooked beans, oregano, cumin, bay leaf, vinegar, and wine. Cover and simmer over low heat for 15 to 20 minutes, stirring occasionally. Remove bay leaf. Some cooks like to thicken the beans by taking about 1 cup of beans and mashing them to make a thick paste. Mix the mashed beans back into the pot. Stir in the sugar; then drizzle a couple of tablespoons of olive oil over the beans. Immediately cover the pot, remove from heat, and let stand for 10 minutes. Serve the by now fantastically prepared black beans over white rice. You may garnish the beans with cilantro and chopped white or red onions. Wash rice until water runs clear. Drain well. Heat butter in heavy saucepan, add grated carrot and peppercorns and fry over a medium heat for three minutes, stirring often. Sprinkle in sugar towards end of frying. Add rice and fry for a further two minutes, stirring constantly. Pour in stock and add salt to taste. Stir until boiling, then reduce to heat to low, cover and cook for 25–35 minutes. Remove from heat and place a cloth or two paper towels under the lid and leave covered for 10 minutes before serving. hi elizabeth, lovely to have met your blog via the lovely comment you left for me. fabulous flavours going on here, and i love your note about palm sugar – it’s a complex version of sweet that makes things pop. had no idea what to make for dinner this evening, but i think a riff on your beans is just what we need. Hope the black beans worked out. I’ll have to post more black bean recipes because I think we need to eat more of them.